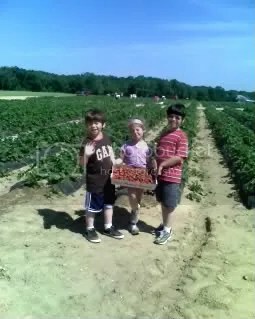 There will be 2 more entries about strawberries … | Me going green ... and dragging my family with me, kicking and screaming! You know … as a warning … it’s what’s going on RIGHT NOW, so it’s what I’m talking about. I took the kids to the farm yesterday, as promised. I was frazzled, and forgot my containers, how very ungreen … I had to buy more. Oh well. Providing I make a habit of remembering them in the future, I have plenty to last quite some time. I also forgot my camera. *insert angry face* I blame my mother-in-law. She was distracting me. So, I took a moment to show them what a good berry looks like, and what to avoid. I showed them what overripe and underripe looks like, and I taught them how to pinch the stem so as not to yank the vines apart. Then I set them to it! I sent them ahead of me to pick, and I went over the vines after them, knowing that there was NO WAY they were even getting half the berries available. I was totally right. Anyway, it was hot, and I wasn’t fully awake yet, and they were driving me crazy by running back to me and asking if every single berry was a good one, LOL, so we only picked about 7 more pounds (I was hoping to get another 10 or so).